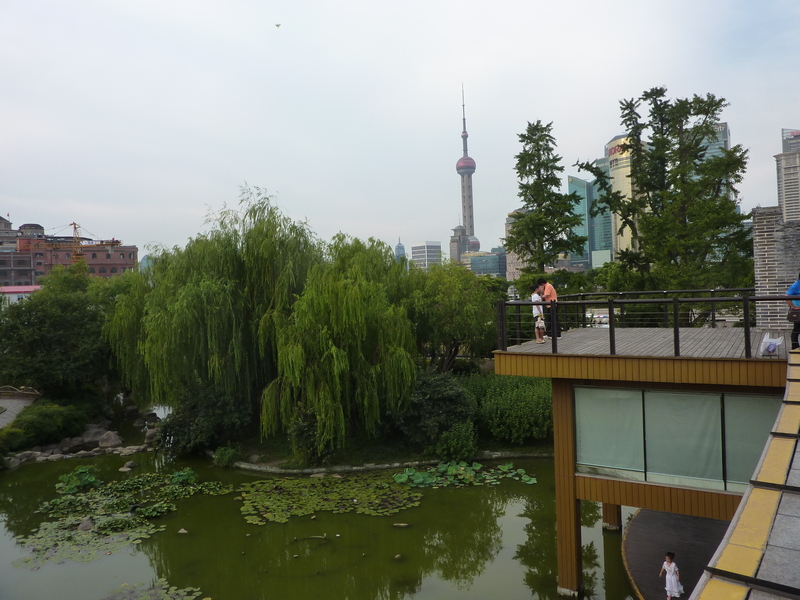 This week Shanghai experienced its most polluted day in about six months. Fortunately, we have the US Consulate and the Chinese Ministry of Environmental Protection keeping an eye on the smog for us. The US Consulate’s figures were accompanied by a health warning of “hazardous” (get indoors now; don’t breathe for a few days). The Chinese State’s assessment was somewhat different, describing it as merely “lightly polluted” (reduce outdoor exercise). The discrepancy is easily explained away by the local government, accusing the US Consulate of measuring different particles sizes. Not being an expert here, I much prefer the benign sounding “lightly polluted”. I’m interpreting it in the same way a packet of crisps could be “lightly salted” – Ok in small doses but too much may cause your lungs too collapse. Back to Sailor’s on Thursday night for fish & chips (counting this as English food) to celebrate JB’s last night in Shanghai (for a whole week). Sailor’s is on Yongkang Lu, an arty sort of street full of tiny restaurants and bars, loads of Westerners and many disgruntled local residents. A few complaints (understandable) from those that live above the restaurants saw the arrival of the police shortly after 10pm to usher everyone indoors. Friday night’s Chinese meal was a buffet-style affair inside another KTV (karaoke) warehouse as Tim took the IS and IT teams out for three hours of singing/wailing. An elaborate computer system, entirely in Chinese, allows visitors to select songs from a list and add them to a queue. Having been a few times, I’ve memorised the right sequence of buttons to take me straight to Radiohead’s “High & Dry” (no Smiths, Cure or Aphex Twin sadly; but they did have a bizarre easy-listening version of Muse’s “Plug in Baby”). Songs are added to a queue to give everyone a go, but mysteriously my and Tim’s songs kept getting bumped to the top…. Bron avoided the ear assault by going out for an Italian instead, so Tim and I joined her later on in Kaiba, a Belgium Beer bar that features a huge selection of beers from around the world (including London Pride). Ostensibly the launch night (even though we’d been there about a month ago), the police were again in attendance to usher people off the street and back into the bar. 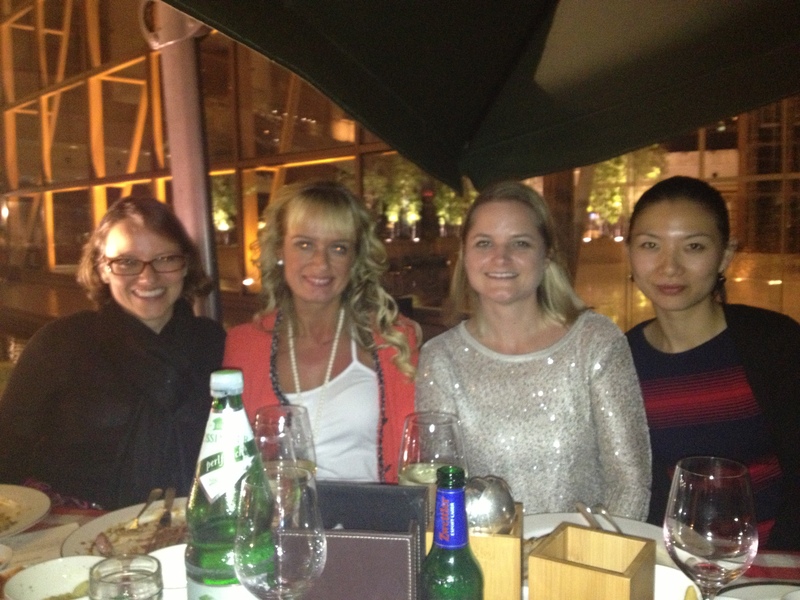 Saturday night was Austrian night, courtesy of Juliane (the only Austrian we know). The Hyatt hotel on the North Bund apparently has an Austrian chef and manager, so why not… Juliane and Nicole fully dressed in dirndl’s, putting the rest of us to shame. I’m not sure I’ve experienced Austrian food or drink before, but the plum schnaps, beef stew and apple strudel did the job nicely. 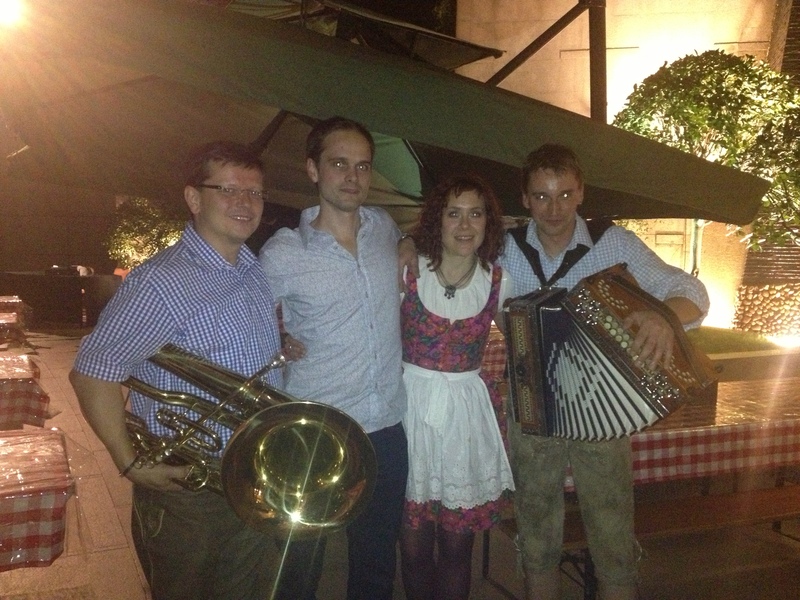 I also don’t know any Austrian songs apparently; even the standing up and sitting down again song got the better of me. 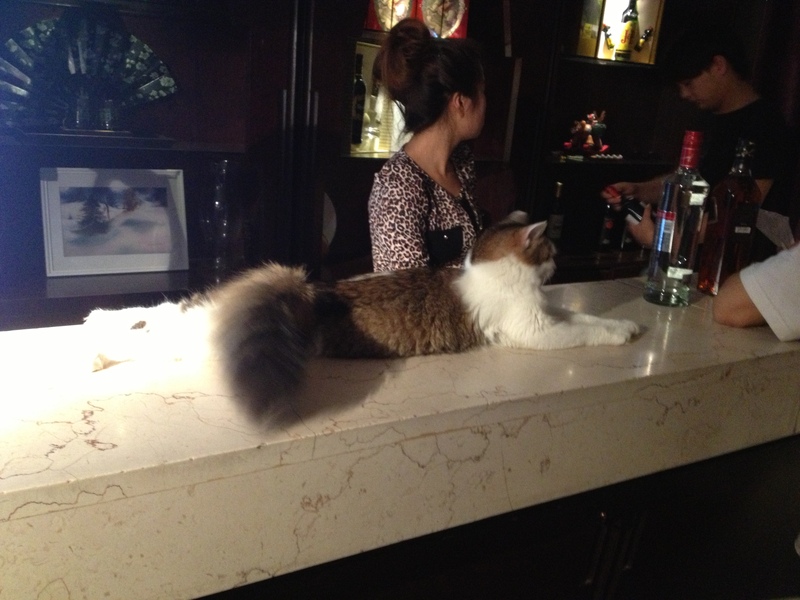 A bar run by a cat. We ended the night with Juliane and Bruce in the Paradise side of a bar called “Paradise and Hell”. One side was kind of white, the other a tiny bit red. Having never been to Paradise before, I now know it features a very comfortable cat that appears to manage bars, overseeing as it did the behaviour of its patrons and the delivery of new beer. I’m writing this early on Sunday morning; knackered thanks to the workman who rang our doorbell repeatedly at 7.20 this morning. Wrong house. Thanks. The man in the photograph perfectly demonstrates a clothes-style I’m reliably informed is referred to as the “Beijing Bikini”. 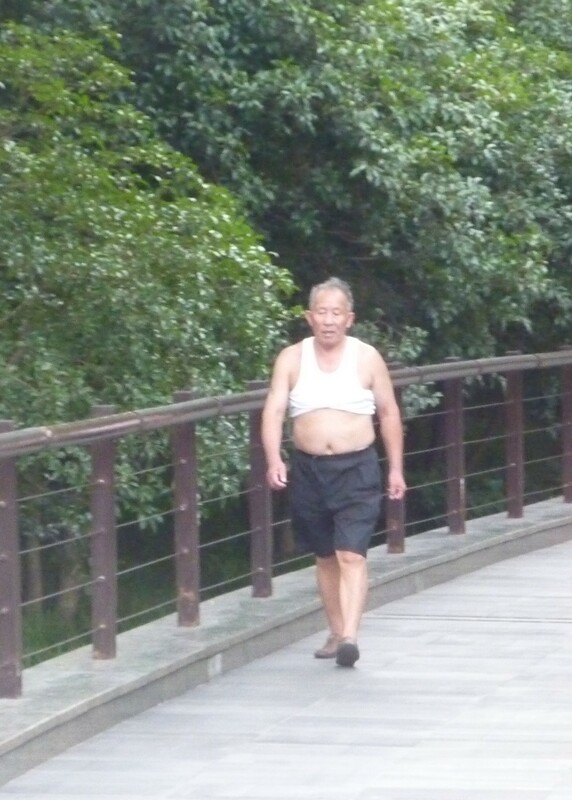 Since it’s so bloomin’ hot outside, rolling up one’s top to allow the air to cool one’s belly seems an eminently sensible idea (a fashion unique to men in China it appears). 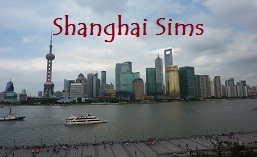 Having spent 2 hours exploring some of the older areas of Shanghai with Bron and Rachel in the heat of Sunday afternoon I was inclined to join in. But fortunately for the locals, my t-shirt tan remains intact. Boxes of insects. And feeding bowls. There are those far better qualified than I to comment on how animals are treated in China (yeah, copout). 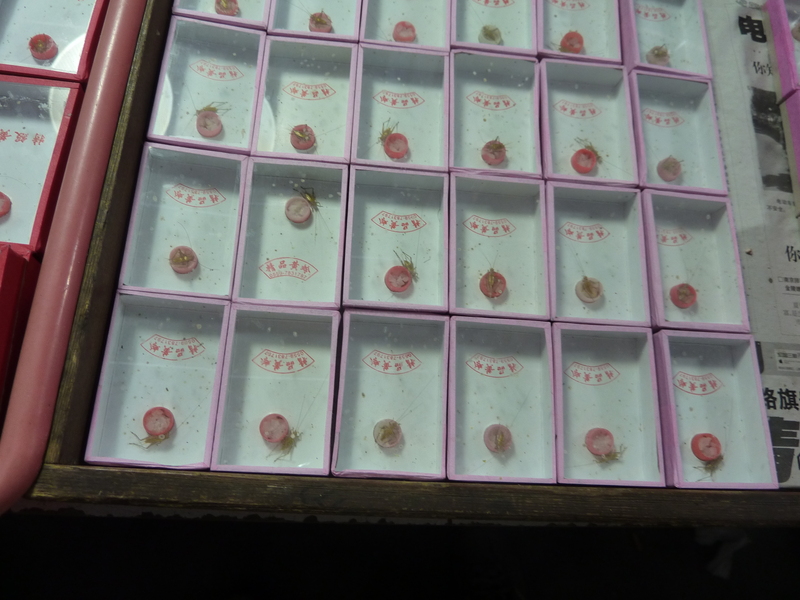 Instead, it was with quiet bewilderment that we stumbled through the huge plant/insect/animal market on Xizang Lu. 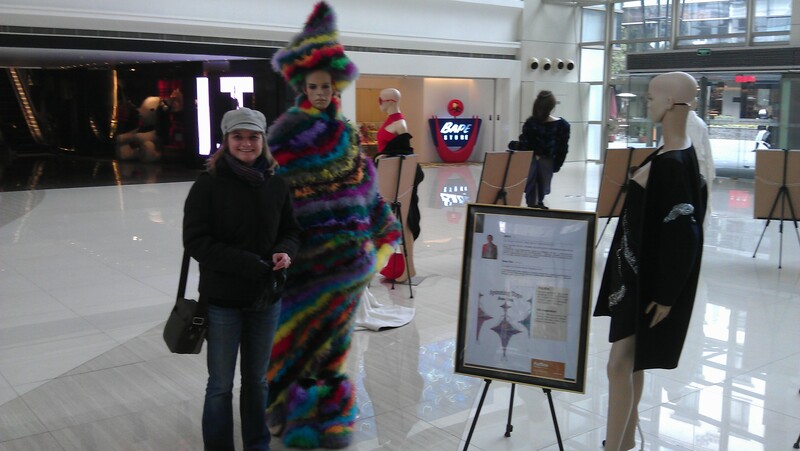 Five months in and sometimes I feel we’re no closer to understanding certain elements of Chinese culture. Crickets in tiny cages; insects in small plastic boxes with what appears to be feeding trays filled with salt; lidded metal pots containing other mysterious insects. All available for you to take home today. Glo London does probably the world’s best steak pie. Guaranteed to take at least 2 days to digest, but well worth the effort. The visiting family Burgess, now in week four of their visit to east Asia, had apparently had sufficient intake of local cuisine to necessitate a trip to a British-style gastro pub/bar. We joined JB, his wife and 2 kids on Tuesday night for the most comforting of comfort foods in an attempt to avoid any further weight loss. 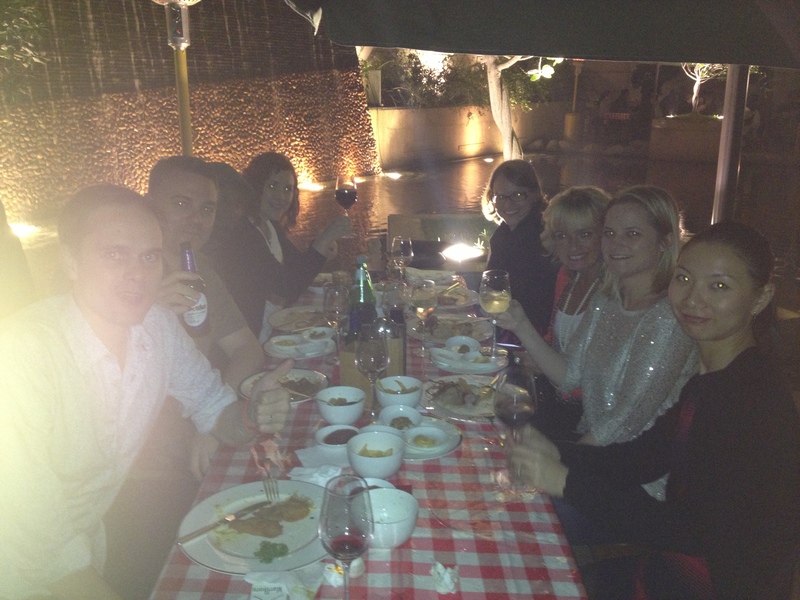 The food was excellent; my only complaint being the lack of British beers on offer (Guinness did the job though). Monday’s attempt at comfort food was somewhat less successful: the lump of meat in our fridge clearly labeled in English as “best bacon” turned out not to bacon waiting to be sliced, but instead a chunk of uncooked ham. At least that’s what we now think, since slicing it and grilling it seemed to turn the meat into pure salt. 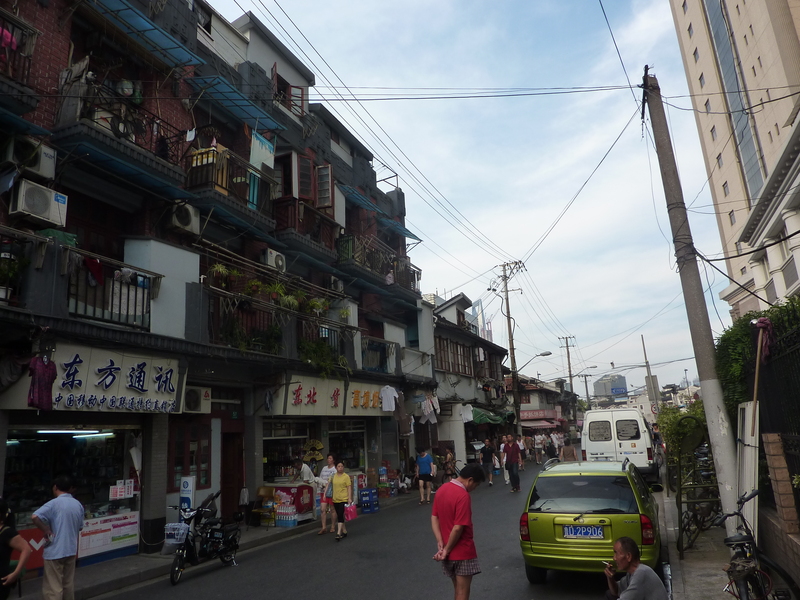 Old streets of Shanghai, with the new just appearing in the upper left. Bron and Rach near The Bund. 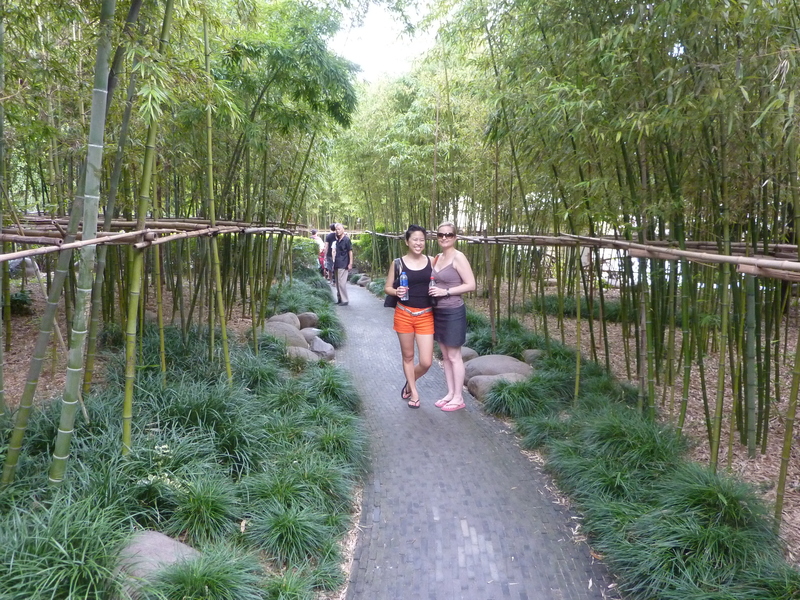 In bamboo world.